Anthony Franze is an appellate litigation counsel at Arnold & Porter Kaye Scholer who has won five Supreme Court merits cases since 2011 and somehow finds time to write thrillers on the side. 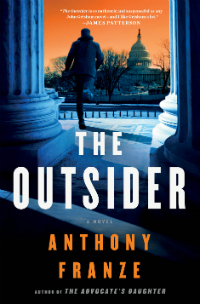 His latest, The Outsider, stars a SCOTUS clerk (natch) who stumbles upon a complicated revenge plot that centers on famous Supreme Court cases and may or may not involve several justices. I interviewed Anthony on his time management skills and his latest novel. How did you decide to become both an author and a lawyer? Was one career the fallback-plan for the other, or did you always intend to pursue both? I actually didn’t plan on pursuing either. When I was in high school and college I played guitar in rock bands, and had delusional notions of making a living at it. Luckily, about the time I was realizing my limitations as a musician, I took an undergrad constitutional law class that sparked my interest in becoming a lawyer. It wasn’t until after law school that I started writing fiction seriously. Looking for a creative outlet after music, I tried my hand at a novel, and discovered I loved writing thrillers. It was more than a decade before I sold a book to a major publisher, and by then I’d found that I really enjoy my job in APKS’s appellate practice, which I know sounds trite, but it’s true. So I plan to do both for as long as possible. I’ve interviewed a few lawyers-turned-authors, but not any authors who are still practicing attorneys (the only other practicing attorney/author I can think of is Scott Turow). How do you balance the demands of your appellate practice at APKS with your writing and family life? We all make time for things we’re passionate about. Whether it’s training for a marathon, cooking, watching Netflix, or whatever. My colleague Lisa Blatt has argued 35 Supreme Court cases and she makes time to coach her kids’ high school debate team. For me, I carve out time late at night to write, and do a lot of editing on the subway. If you’re ever in D.C. on the Metro, I’m the bald guy with pen in hand who jumps up suddenly because he’s missed his stop. The protagonist of your latest novel, The Outsider, is a Hispanic Supreme Court clerk who graduated from a lower-tiered law school who is an outsider in the world of well-heeled SCOTUS clerks. Do you think having law clerks with a more diverse background would benefit the decision-making of the Supreme Court? I think diversity benefits all institutions. But I can’t say whether or not the makeup of the clerks impacts the Court’s decisions. No question, the clerks tend to be bright and accomplished, but most are only a few years out of law school without a lot of legal experience—they’re apprentices. They help keep the trains moving at the Court reviewing cert petitions and assisting the Justices, but I doubt they play a role in the actual decision-making. 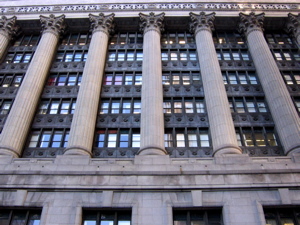 Still, I think the more diversity at One First Street, the better. The Outsider reads like a John Grisham novel and has received praise from James Patterson. Who are your literary role models? In literary fiction, I’m partial to Hemingway or Cormac McCarthy. Both use sparing prose, yet paint the most vivid scenes. But the authors who inspired me to try fiction were thriller writers, including Grisham, Patterson, and too many others to list. A great piece of advice is Write the book you’d want to read. My favorite novels are thrillers, so that’s what I write. What skills or rules from legal writing carry over into fiction writing and vice versa? Elmore Leonard’s rule of writing applies to both mediums: “Try to leave out the part that readers tend to skip.” Yes, footnotes, I’m talking to you. What’s more nerve-wracking: waiting for a judge’s decision or a book’s reviews? Definitely awaiting a court’s decision. Rulings impact real people’s lives. And after you’ve immersed yourself in a client’s case and given it your all, you can’t help but be personally invested in the outcome. Of course, I’m all for favorable book reviews. But my main objective is to entertain readers.